108 HONDIUS, H. Europa exactissime descripta. ( Amsterdam, 1638) Beau col. ancien. Papier un peu jauni, petites rousseurs. - Paper slightly age-toned as usual, brown spotting. 380 x 508 mm. 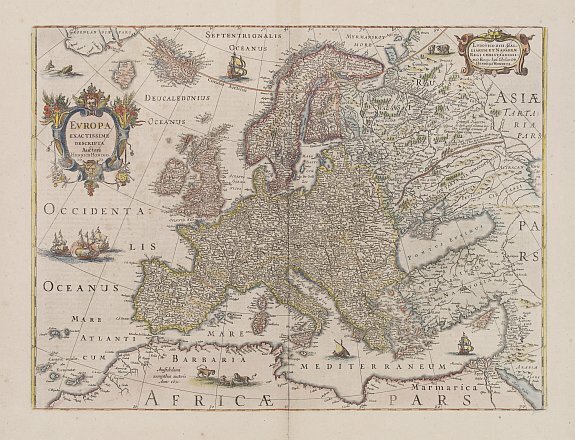 � Carte dat�e 1631, publi�e dans l'�dition latine de 1638. Cartouche de d�dicace � Louis XIII. - Embellished with two cartouches, several ships and a sea-monster, polar bears and lions. Now with the imprint of Henricus Hondius and the date 1631. With Latin text on verso, published in 1638. 109 DELISLE, G ./ BUACHE, Ph. / DEZAUCHE, J. Carte de l'Europe Dress�e par G. Delisle et Ph. Buache.. Revue.. Par J. A. Dezauche. ( Paris, 1827) Limites en col. ancien. Bel exemplaire. 490 x 605 mm.